Resources to give you practice forming and using the preterite. 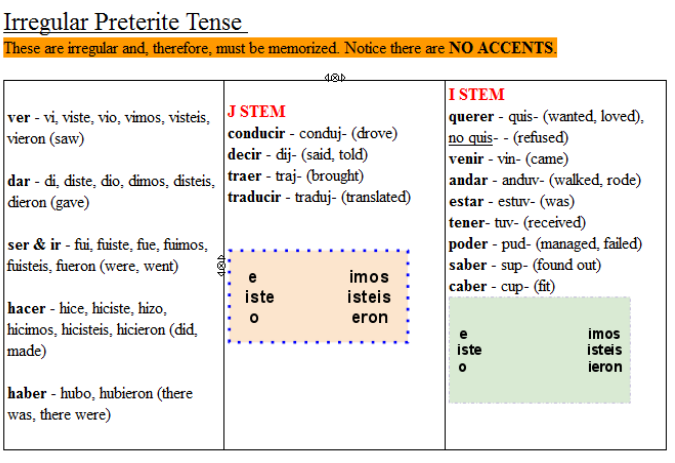 If you want to practice preterite vs. imperfect (Spanish 3) click here. Study Spanish: Click through the lesson to see regular and irregular preterite forms. A great written lesson to review! Burrito Builder! Preterite -AR , Preterite -ER Conjugate the verbs in the preterite to build burritos! Super fun! Start on easy but work your way up to Hot Tamale!! (NOTE: You MUST include accents or it will not count it. To include an accent hold the "shift" key while pressing the vowel you want to use. Conjugemos - Regular preterite practice. Battleship! Play against the computer - try it at level 'medium' - it won't be too hard! "Rags to Riches" (similiar to the Millionaire game) - includes -ar, -er, -ir regular verbs, -car/-gar/-zar verbs, and hacer, conocer, ser, and ir. Señor Jordan - His website has a video for almost anything you can think of! He has 19 videos related to the preterite (too many to post on here). Scroll down to the 2nd section "Videos avanzados" and the videos are 6-9 and 17-31. As usual, these are youtube and cannot be seen at school - but they are great for reviewing at home. I really like his irregular preterite song - I am linking that below!